I had a random thought in the shower this morning: if the plural of "Attorney General" is "Attorneys General", should the plurals of "Les Paul Junior" and "Les Paul Custom" be "Les Pauls Junior" and "Les Pauls Custom"? Les Pauls Custom shows possession of a Custom by a person named Les Paul. Les Paul Customs are more than one Custom Les Paul (guitars in this case). In this case Custom is being used as a proper noun (hence the capitalised C). This means Customs is appropriate. It is Attorneys General because it is the attorneys that are pluralised, not the general (meaning the public in this case). It is normal to pluralise the principle part of a compound noun. 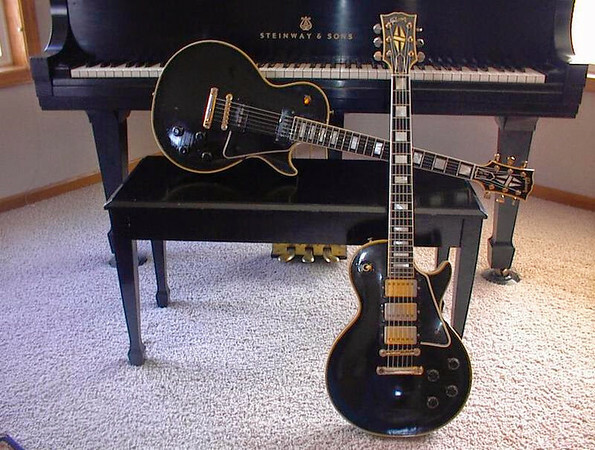 If we just called the guitar in question a Gibson or a Les Paul it wouldn't be immediately obvious which model. If we say Junior it is much more apparent. Bear in mind you only use shortened versions of compound nouns when the target audience would understand what the missing words would be. I wouldn't expect your average man on the street to know what we mean by a Junior. Just an Englishman's interpretation of a language that once belonged to us. The can be a shower is a real source of brain food. Last edited by Yelly; 03-14-17 at 07:33 AM. In this case Custom is being used as a proper noun (hence the capitalised C). It is normal to pluralise the principle part of a compound noun. If we just called the guitar in question a Gibson or a Les Paul it wouldn't be immediately obvious which model. If we say Junior it is much more apparent. Bear in mind you only use shortened versions of compound nouns when the target audience would understand what the missing words would be. that be some cereals worderlization ! Let's see. Anglish is my first language of which I speaks the 'Merican vernacular so's I will be givin' youze a lesson in how our speakin' werks. 1) We cayn't use Les's because it would technically be spelled Les' which is too hard to describe to people anymores as English classes and scriptin' be too difficult for the younger gens to cypher. c) So we would then move the plural to Paul which would become Paul's which would be confused with Mrs. Paul's which would move the subject to tasty fishes which we cayn't do because there be too many porpose huggers out there. .v) So PC lingos forces us to makes it Customs. Les Paul Customs and Les Paul Juniors is the answers youze be seekin'. There is one AG too many. Ah, English can be such a fun and frustrating language. As a former high school teacher myself, the bait of this thread title was too much to resist. Imagine my satisfaction in discovering the thread subject matter to be already addressed - with some humor to boot. Good job, gentlemen! Now, maybe someone here can make sense of the various plural forms of mouse, moose, goose, etc. Or explain why a fat chance and a slim chance are the same thing. No it does not, Les Paul's Custom would show possession. Adding apostrophe s to a noun shows possession, adding an s (or es if it already ends in s) pluralises the noun. So, if a man's last name is Foot, and he attends a family reunion, is it proper to ask him, "How many Feet attended the Foot reunion?" [MOD EDIT] Spammer above was sent to the dust bin. Post snarking on above Spammer's spam deleted. Last edited by Ed Driscoll; 02-11-19 at 08:46 PM.